September and October can be the best months for bike day trips – the days get cooler and leaves will soon change colour. Within the city, trails such as the Don Trail between Sunnybrook Park and Lake Shore Boulevard, can be beautiful during those crisp, autumn days, but crowded too. The same with the Taylor Creek Trail and the Martin Goodman. Luckily, it is easier than ever to go for long, peaceful rides outside the city. Until recently, without access to a car, it was only possible to transport bikes in a bike box aboard a train or plane (and paying handsomely for the privilege, not to mention the hassle of disassembling the pedals and turning the handlebars), or bringing the bike aboard a weekend or off-peak GO Train on the Lakeshore Line. Sure, GO’s Lakeshore Line provides a nice way to do a bike trip without straying to far from an easy ride home. The Waterfront Trail extends to Hamilton (albeit with some on-street sections), and with the nearby GO corridor, one can ride with the bike back into Toronto at many different points along the way. Last year, I surprised myself by cycling over 60 kilometres along the waterfront from Exhibition Place all the way to Downtown Burlington before riding back up to Burlington GO station. To the east, the Waterfront Trail is a misnomer (neither a trail nor on the waterfront) through much of Scarborough, but a nice ride between Guildwood and Ajax GO Stations is very possible via Highland Creek and Rouge Park. There are now many more options for getting out of town with your bike. VIA Rail’s new Biketrain initiative, the installation of bike racks on all GO buses and most Ontario transit operators, allow cyclists to easily take bicycles farther afield, and take advantage of rail trails and other cycle-friendly locales throughout southern Ontario. Unfortunately, this is not well marketed; I only managed to stumble upon VIA’s Biketrain page. In July, I took advantage of that program and took my bike on a VIA train to Kingston. New bike lanes and signage in the Limestone City make the ride from the from the somewhat remote station to the waterfront and downtown easy and pleasant. While there, I cycled the quiet roads of Wolfe Island and even took the ferry across the St. Lawrence River to Cape Vincent, New York, for lunch and a ride to the lighthouse at Tibbets Point. The provision of bike racks aboard each corridor train equipped with a baggage car make bicycle assembly/dis-assembly unnecessary, though the $20 one-way fee for transporting bicycles still applies. In mid-August, I cycled the rail trails between Uxbridge and Peterborough, stopping in Lindsay for lunch. I utilized the racks on GO buses on either end to transport my bicycle. (More details and some photos of this ride are below the fold.) The weekend after that, I rode from downtown Kitchener to downtown Hamilton via Paris and Brantford, just over 100 kilometres, again mostly on rail trails. I used GO buses to transport my bike to Kitchener and back downtown from Hamilton. 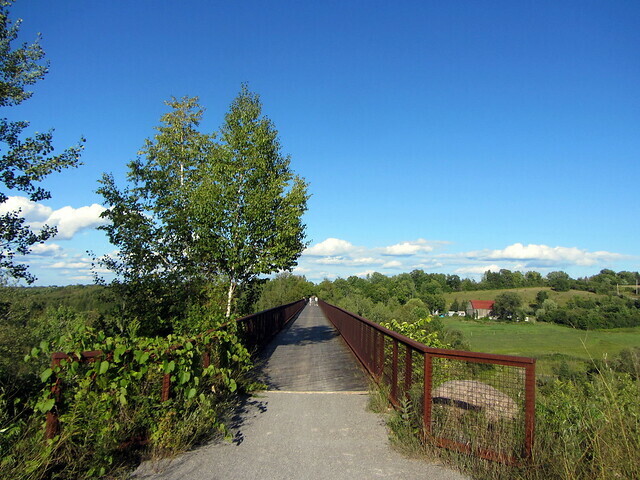 Rail trails, at least in theory, are ideal for recreational cycling: they are relatively flat and separated from motorized traffic, making it comfortable to go at one’s own pace. It should be said though that rail trails are not well suited for road and racing bikes – though hybrid and mountain bikes ride great on the crushed stone surface . Also, one should be prepared for unexpected detours. The section of the Uxbridge-Peterborough ride within Durham Region was unexpectedly and disappointingly sub-par. Happily, other trails, such as the Kitchener-Brantford and Brantford-Hamilton rail trails, are in excellent condition. The ride from Uxbridge to Peterborough was very interesting. Val Dodge recently wrote about his ride from Peterborough to Omemee and back, but I managed to do the whole trip. The trip starts from the Uxbridge Station, still used by the York-Durham Heritage Railway. The GO buses between Union Station and Uxbridge terminate right in front of the station, which is the end of track from Toronto. In 1991, the rails were removed between Uxbridge and Lindsay. The trail starts a little bit to the northeast, at Main Street. 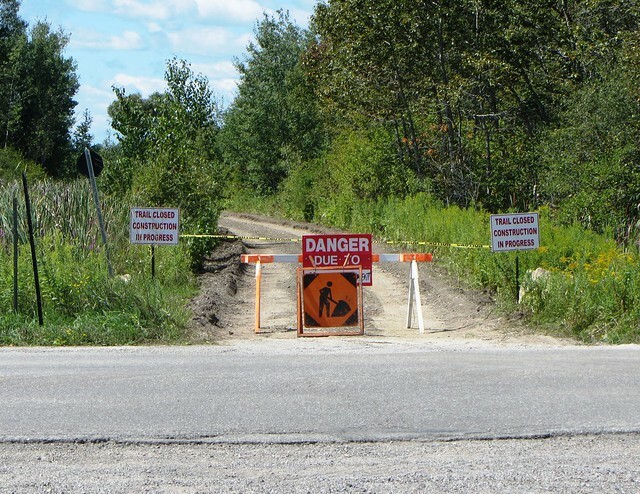 In Durham Region, the trail is at times rough and difficult to ride. 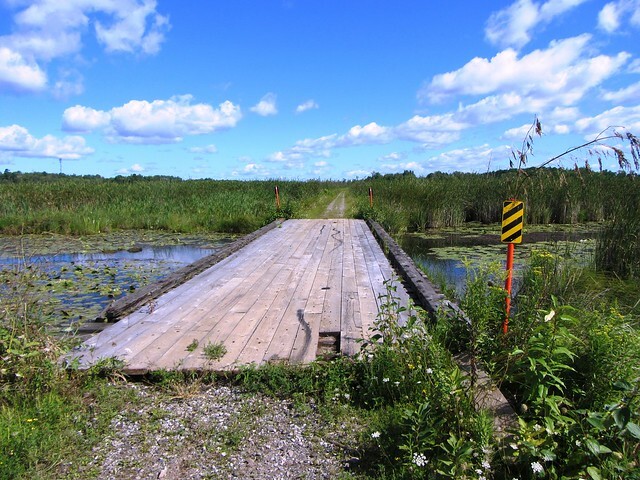 In winter, it is used as an official snowmobile trail, but is not kept to ideal conditions for cycling in places due to rough gravel and in places, muddy earth. Bridges, such as the one above, are not level with the trail surface. Just beyond Blackwater Junction, without advance notice, the trail was completely closed for construction. What was especially frustrating was that there were no posted detours (that would never happen for a closed road), though my smartphone directed me on country roads to Simcoe Street, where the trail resumed. But the construction here hopefully means the rest of the trail through Durham will be improved. East of Simcoe Street, the City of Kawartha Lakes maintains the rail trail (also designated as part of the Trans-Canada Trail) in better shape, and it was smooth riding all the way to Lindsay and from there to Peterborough. Bridges that spanned the railway now act as convenient grade separations for cyclists and hikers. 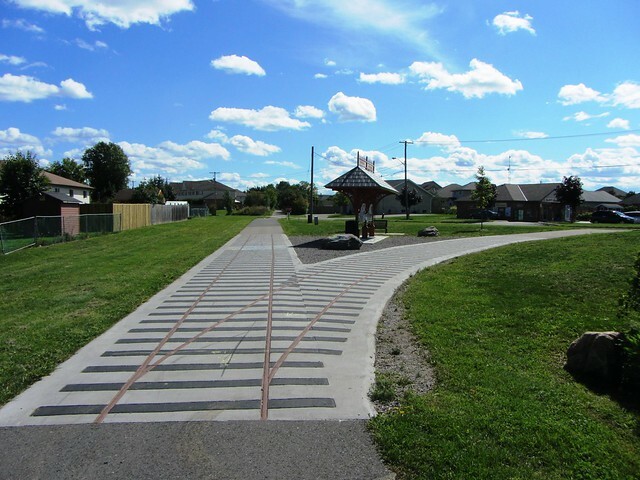 Especially interesting was Victoria Junction in Lindsay – a parkette commemorating a former railway junction. An interpretive pavilion and concrete patterns echo the former alignment of the tracks. At one time, tracks led from Lindsay owned by CP and CN branched out in seven directions – today, none are left. 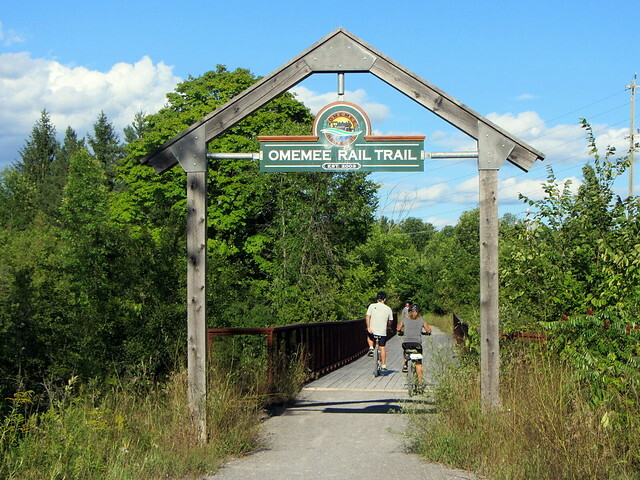 The trail is at its scenic best between Omemee and Peterborough, where the trail crosses a high-level trestle over a lush valley. I ended my trip in Peterborough, which has a great variety of restaurants and bars downtown to end the day before catching the GO bus back to Oshawa Station. This is something I have to do. Thanks for the idea, this sounds so fun! Hopefully by next year the trail will be in better shape. Great to see exploring Toronto and the surroundings on bike promoted on Spacing. I’ve been exploring lot’s of great ravines and trails in Toronto, and using the excellent website bikesandtransit.com to venture further beyond. One of my favorites so far, and very doable in a day, is Go train to Guildwood, the ravine, along the water (with some small detours) all the way to Oshawa). You can even follow the ravine trail in Oshawa up to Bloor, all in all almost 60 km with almost no time on public roads (see map: http://www.mapmyride.com/routes/fullscreen/132297627/) – did this with two friends last weekend and it was stunning. Stian: Yes, I’ve done Guildwood to Ajax, which apart from getting around Frenchman’s Bay in Pickering, is a very nice ride. The part that bothered me was the section between Ajax and Whitby, where the Waterfront Trail follows busy Bayly/Victoria Street, which is a two lane street with gravel shoulders. Hopefully a proper paved trail can be built there. HL: You bring up a good point: the bike racks on GO buses only hold two bikes and are first come, first served. It’s great as long as you are riding solo or as a pair, and you get to the bus first. GO allows folding bikes to go in the baggage area of their highway coaches, and on rush hour trains. Cool, I will try it this fall, maybe with the whole family. I suppose GO bus won’t work for that, so probably will need to hook up another family to do car shuttle. Peterborough itself is quite a bike friendly place, and has a quite active downtown, with live music to be found every night somewhere downtown. Only problemish, was there was only 2 hotel choices downtown (A Holiday Inn along the Otonabee River, conveniently though it is along waterfront trail that connects to other trails including the Uxbridge-Peterborough and a small Boutique Hotel).Once there you can bike along the beautiful Trent Canal up to Lakefield, or take a different route and go to Bridgenorth on Chemong Lake (most of the route is along a bike lane in the city of Peterborough, and along a country road leading to a well maintained private trail with public access). You can also get to Hastings and Trent-Hills but I’ve yet to visit that area. GO does run to Peterborough now, but you have to transfer in Oshawa to a bus. 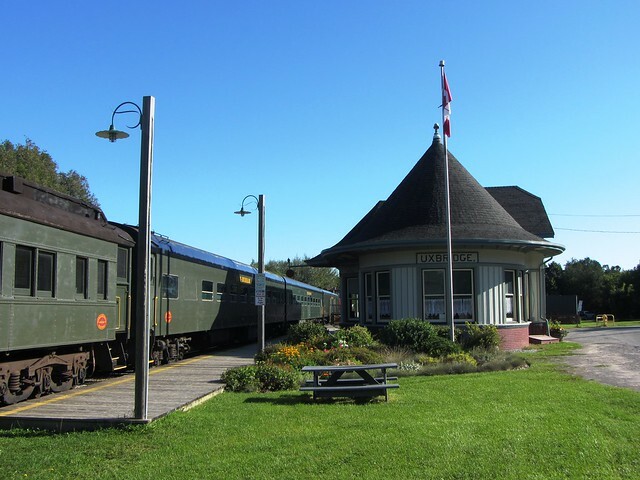 Soon though after 2014, there will be a direct train to Peterborough from Union Station, operated as a non-profit organization. Thanks for the trail update Sean. 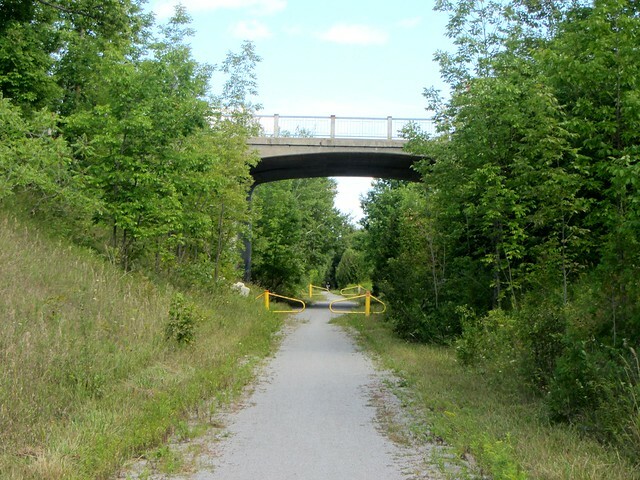 I rode Uxbridge to Lindsay twice last summer and loved it except the poor trail conditions from Uxbridge to Simcoe St. The Kawartha sections are great though. It prompted me to contact the Lake Simcoe Conservation Authority who assured me the whole section was due to be upgraded. Your “trail closed” pic tells me it’s on the way. Very exciting!